Home News & Opinion Will the Falcons’ plan to lure fans with cheap concessions work? We already knew that Atlanta’s $1.5 billion Mercedes-Benz Stadium scheduled to open in 2017 will be equipped with a retractable roof inspired by the Roman Pantheon and the world’s largest HD video halo screen. This week the Falcons announced another amenity that was surprising for a different reason: dirt-cheap concessions. 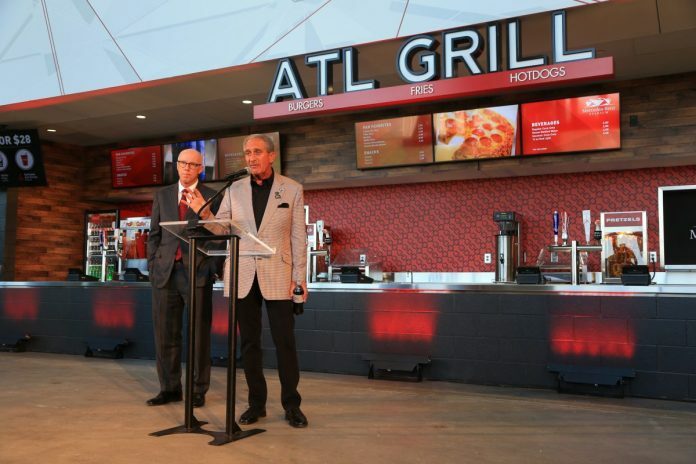 At a press conference on Monday, team owner Arthur Blank waved goodbye to the days of $6.50 soft drinks and unveiled his new “fan-first” menu—$2 hot dogs, $3 nachos, and $5 Bud Lights—that he deemed a gesture of goodwill to loyal Falcons fans. For $28, a family of four will each be able get hot dogs, waffle fries, and refillable sodas. The billionaire’s announcement came with a pledge: Rising up no longer meant raising your credit card limit. Bradbury believes the team introduced the “fan-first” menu to cater to an audience that isn’t their first priority with Mercedes-Benz Stadium. “This new stadium largely captures these luxury income streams that the old stadium couldn’t,” he continued. Whereas before the Falcons might’ve have charged everyone $7.50 for light beers, the team won’t have to price out any of its fans, offering both artisanal and affordable menu items. In doing so, AMB Group CEO Stephen Cannon said, the Falcons expect to make more money by lowering concession prices, though he declined to discuss specifics figures with the press. How does that work? Sheer volume: by opening two-thirds more concession stands, installing soda refill stations, and increasing the capacity to cook onsite so food can be served faster. Also, menu items will be priced at full dollar increments to save time spent scrounging for loose change. “We’re going to get them in earlier, they’re going to linger a little bit longer, they’re going to be a little freer and not think that they’re getting ripped off,” Cannon said. Like other NFL teams, the Falcons received $226.4 million in revenue sharing from the league’s TV deal two years ago. Because football teams only play eight home games a year, food and drink sales matter less to the Falcons than they do for the Braves, which play 81 games each regular season. Levy Restaurants, the company contracted to handle Mercedes-Benz Stadium concessions, has signed a fixed contract with the Falcons instead of a revenue-sharing deal. That allows the team to set concession prices, leaving the franchise in control of how much it makes in a sector known for its high-profit margins. Because of that, Chris Bigelo, a food service industry expert with clients in all four major sports, says the move is risky for the Falcons, even if it creates the illusion that fans are paying less overall at Falcons games.